I interviewed Jesse Stay, author of the brand-new book Google+ for Dummies, Portable Edition. Jesse has also written three more books about Facebook, including Facebook Application Development for Dummies. In this interview we talked about Google+, why it’s different and what it means to businesses. We also talked about the mobile side of Google+, where Google might be headed and much more. Mike: Jesse, let’s start with why Google+? What makes it unique? Why should people consider it when they’ve already got Facebook accounts and Twitter accounts and LinkedIn and beyond? The answer is really Google itself. There’s a good chance that you use at least one Google product, at least their search, if not Gmail or Google Reader. I use Blogger.com, Android and Google Maps. There is a whole slew of Google products that you’ve probably touched in some way or another. Google+ is intended to be the amalgamation of all of those products into one product that ties people together across all of Google. Right now, at a minimum, if you sign up for Google+ and you visit Gmail, for instance, you’ll have a little bar at the top of the screen that lists your email address. Right next to it, it will show you your Google+ notifications, and then there’s a little Share button next to it. If you click the Share button, you can update Google+ right from within Gmail without ever having to leave Gmail. Mike: Let me clarify what I hear you saying. Everybody probably uses some Google product in some capacity, whether it’s Google Search, Google Calendar, Google News—or who knows what else Google has that people don’t even think twice about. Because they’re already using all these things, the fact is that Google+ is integrated into it, so they don’t really need (like Facebook needs) pull mechanisms that get you back in. At least in its early days, you had Facebook constantly emailing you every time something happened. Google owns all of these platforms, so it makes a lot of sense, I guess, to work where you work anyway. Is that the mentality behind this? Jesse: Yes, that’s exactly it. One example is right now if I do a search on Google, it’s probably launching for different people at different times. On many of the articles that get returned on Google, I see little icons of my friends and faces of my friends that have also +1-ed those articles before. So they’re already bringing that social experience into their existing products. Even into their flagship product, search. They’re already starting to find ways to bring Google+ into that. Mike: Do you have any recent stats on the adoption rate of Google+? Jesse: Google+ hasn’t really officially announced any numbers per se, at least not recently. But the numbers I’m seeing from at least some of the data mining that some of my friends are doing, they’re counting probably in the range of about 50 million users right now. This is pretty high, considering they just launched, I think, about two months ago. Mike: That’s phenomenal! The reason I think Google+ is here to stay has to do with that little red box with the number in it. I know it seems like such a subtle little thing, but the fact that Google was smart enough to animate this little box so that every time you happen across a Google property, that little number flies across the screen like a slot machine almost and lets you know there have been updates. I think that is almost impossible to ignore, don’t you agree? Jesse: In fact, it takes some practice to learn to ignore it. That’s what I’ve had to do because I get so many. For those people who don’t get as many as I do, it lures you in. It pulls you in and you don’t even have to be on Google+ to see that. You can be on Gmail, you can be on Google Calendar, you can be on any number of Google sites and that little red box is still there and it follows you wherever you go on any of Google’s products. Mike: And I think that’s the brilliance that’s going to keep people coming back into the system because they may not normally have remembered to ever go back, but that will bring them in. In Chapter 7 of Google+ for Dummies, you talk about social etiquette. How does the etiquette on Google+ vary, if at all, from the other networks? What’s been your experience? Jesse: It’s a slightly different network with slightly different technology, so it is going to have a slightly different etiquette. There are a few things that I’ve seen. For instance, right now on Google+, you can tag other people, which you can kind of do on Facebook. But when you tag people on Google+, it is a little more in your face in many ways because of that notification bar that follows you around. You have to be a little more careful when you tag someone on Google+ versus elsewhere because there’s a good chance they’re going to see that tag, and tags can end up getting annoying if you’re doing it too much. Mike: Because Google+ has a lot of different granular privacy controls, I’ve found, for me, that a lot of people do not get email notifications, except if they’ve been @tagged. And I’ve found that when you’re having a discussion, it seems to me as though @tagging the person in particular in a thread seems to be the going etiquette. You @tag the person you’re referring to and not just type in their first name. Have you found that to be the case? Jesse: That seems to be the culture right now. It does give them a little extra layer of notification, but I haven’t seen too many people complain about that. Mike: This is really good stuff, Jesse. Given that Google+ owns the world’s biggest search engine, what kind of impact do you think Google+ and +1 are likely to have on search results? Jesse: Right now, when you do a search and you’ve enabled Google+, you’ll see different search results. If you have more people you’ve Circled, you’re more likely to see content from them than if you haven’t Circled many people. That’s very powerful because it means that if you get your content into Google+, your content is more likely to be visible and noticeable to people. Even if your content isn’t the first result on Google, I predict that if your content has a lot of people +1-ing it who are in a person’s Circles, there’s a good chance that your content will still be noticed. So it has a huge effect, I think. Mike: Facebook has a social graph and maybe Google has something similar. The reason I’m asking is because I notice that when I’m logged into Google, I see different search results than when I’m logged out of Google. I’m wondering whether you think that with Google+, somehow it’s going to look at my network of friends and the kinds of content they’re looking at? If so, and you and I Google the same thing, like “Facebook marketing,” would that change the results for both of us? Jesse: Google has tracked some of that already. Right now, if you’re logged into Google via Gmail or any other Google product, it by default keeps you logged in when you’re searching. When you search, it does factor in little things it has detected—things that you searched for in the past and things that you have shown interest in. Google tracks some factors of that. They don’t expose exactly what that is, but there are elements that they are tracking with that. That will increase in the future the more your friends are brought into the process. Already, I’ve seen even Twitter friend lists brought into this. Facebook friend lists I think also are included in this. Google’s value is giving you the most relevant search results, so they’re very interested—no matter what site you visit, no matter where you go and no matter what you search for—in figuring out who you are and what you’re interested in. I think even more in the future, what your friends are interested in will affect your search results. I think all of that factors into search and you’ll see even more of it in the future. Mike: Jesse, there are hundreds of millions of people walking around with iPhones, Androids, iPads and other kinds of devices. How does Google+ measure up on the mobile front? Jesse: I think right now they’re doing fairly well. It doesn’t come by default with Android yet, but it’s pretty easy to download at the moment, and it integrates really well with the Android experience. Android, as an operating system, is the most widely used operating system of smartphones right now. As a result, it has the potential to be huge on mobile. Mike: The iPad is a different story, though. Jesse: The iPad is a different story—they need to update their tablet experience and I don’t think they’ve put much focus on that yet. When you look at it, mobile is a very social experience—taking pictures and archiving the things that are happening around you, your location, and stuff like that. That’s all very interesting to your friends. As a result, I think mobile is potentially the future of Google+. I think that’s where most people will end up using it in the future if they’re not already. Mike: Let’s talk about apps a little bit; which I know is something near and dear to your heart. Are there apps for Google+? Is there going to come a day where there might be something like iFrame going on with Google+? What’s your take on the whole apps frontier with Google+? Jesse: Google+ just launched an API—a platform for building those apps. It’s very limited at the moment in what you can and can’t do. It has rate limits (the amount of times you can query the Google APIs to access) applied to it that are very strict, so you’re not going to see many apps right out of the gate. The focus right now is on integrating into third-party websites, integrating into browser plugins, and stuff like that, so you’re not going to see apps that integrate right on top of Google+ like you’ve seen with FarmVille on Facebook and other things that happen on Facebook.com. Mike: When it comes to scheduling, and HootSuite and all of these other things that are out there, is the API that’s been released recently going to be working with these kinds of third-party management apps, likely? Jesse: Are you talking about TweetDeck and others? Mike: Yes, and HootSuite and SocialOomph and all those other things. Jesse: In terms of those, the potential is there. Again, the problem right now is API rate limits. That may inhibit some of those types of apps from working with Google+. I anticipate in the future that those types of apps will be available and you will see them integrate with Google+. I think the Google+ API has to evolve a little bit before that happens, though. Mike: Let’s talk about Google Analytics and Google+. Do you see a connection there? Is there any kind of future? Do you see somehow Google Analytics and Google+ having some sort of marriage down the road that might be useful for the consumer or the business or the marketer? Jesse: Oh, definitely. I think there’s a huge future for Google Analytics and Google+. Google Analytics has already started integrating social components into the Analytics software. I don’t doubt that they probably will include Google+ with those stats in some form in the future. Google hasn’t hinted at any of this, so it’s hard to say one way or the other, but there’s a very good chance, I think, you’ll see Google+ in Google Analytics. If you have a +1 button on your website or you’ve incorporated that into different websites, it will include that data in there already. That is part of Google+, so you’re right, they actually are including that already in some of the Google Analytics. I anticipate that to be expanded even further in the future. Mike: Looking down the road, let’s say two years from now, how do you think Google+ is going to change the landscape of social media? Jesse: It’s tough to see at this point. I think it has incredibly strong potential—the fact that Google is behind it and that it’s going to cross every product that Google owns. Google is even talking about removing features from products and removing other products entirely as a result of moving focus towards Google+. They’re releasing new features of Google+ every single week. It’s a very focused team that’s working very hard beyond their 40 hours a week to make a powerful product. Mike: My last question for you, Jesse, is about your book. Where can people find out more about you and your book? Where do you want to send them? Jesse: If they just go to Amazon and search for “Google+” or “Google+ for Dummies,” it’s one of the only books out right now for Google+. There are few personal books, and I think Chris Brogan is also writing a book targeting businesses as well. But beyond that, this is the first book that’s published by a major publisher out there, so just search for “Google+” or “Google+ for Dummies,” on Amazon and you should be able to find it there. The short URL, www.stay.am/gplusdummies, will also take you right to the Amazon page. Mike: And if people want to learn more about you? Jesse: We have a Facebook page as well. The target audience of this is really Facebook users who are trying to learn what this new thing is, so we actually created a Facebook page for it: www.Facebook.com/googleplusportable. I’ll give you my profile ID. It’s http://profiles.google.com/jessestay. You can find me on Google+ that way too. 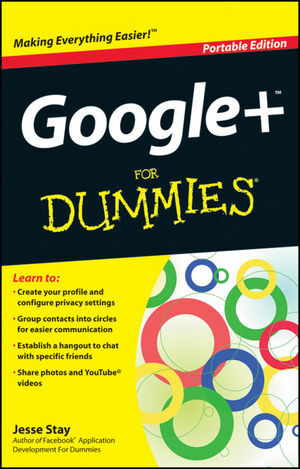 Mike: I strongly recommend you pick up a copy of Google+ for Dummies, Portable Edition. I was fortunate enough to see a very early draft of this book and it’s really very well-written and very enlightening. Google+ is definitely different than anything we’ve seen. It’s got similarities to Facebook, of course, but it’s got its own unique things that make a book like this very valuable, and I strongly recommend it. Jesse, thank you so much for taking your time to talk with me today. Jesse: Thank you so much for the opportunity, Mike. I really appreciate it. Listen to our complete extended interview below to hear more about Jesse’s view of Google+ and why it’s different and unique. What do you think of Jesse’s view of Google+ and what it means to business? Leave your questions and comments in the box below.